European Parliament elections have often been criticised from the perspective that they fail to engage voters. Cristina Ares Castro-Conde presents a comprehensive comparison of the positions contained within the manifestos of all of the main European political parties. She argues that when the programmes of each party are broken down, there are clear differences visible between the parties, highlighting that the elections represent a chance for voters to make a real choice over the type of Europe they would like to see. European Parliament (EP) elections are due to be held on 22-25 May. European voters have often approached EP elections from the perspective that their vote simply represents a decision to support or oppose the European project in general, or that their choice should be about supporting or penalising the party or parties in government at the national level in their country. The objective of this post is to show the details of the programmes being offered by each of the main European political parties to help inform voting in the elections and show that beyond these broad issues, the elections give EU citizens a real choice over what type of Europe they would like to see. To achieve this, the electoral manifestos of the parties with representation in the current European Parliament have been analysed. These parties are the European People’s Party (EPP, 275 members), the Party of European Socialists (PES, 194), the Alliance of Liberals and Democrats for Europe and European Democratic Party (ALDE and EDP, 85 members altogether), the European Green Party and European Free Alliance (EGP and EFA, 58 overall), the Party of the European Left (EL, 35 members in their political group), and the Movement for a Europe of Liberties and Democracy (MELD, 32 members). In addition, the electoral platform published by the European Alliance for Freedom (EAF) has also been assessed. The EAF’s platform is closely linked to the Front National leader Marine Le Pen, who is currently a Member of the European Parliament, but not a member of any political group. Last, as the electoral manifesto for the Alliance of European Conservatives and Reformists (AECR, 56 members) is not available, the 2014 European election manifesto of the British Conservative Party has been assessed instead, given it is the primary political force in the AECR group. The first set of tables, shown below, illustrate the difference in political priorities contained within the manifestos of each of these parties. 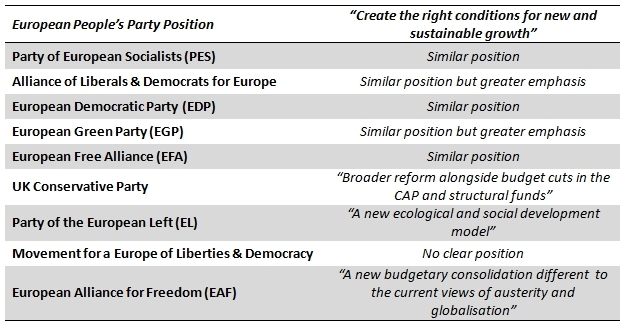 To structure the comparison, the parties’ priorities are compared with the party which has the most representation in the current European Parliament, the European People’s Party. 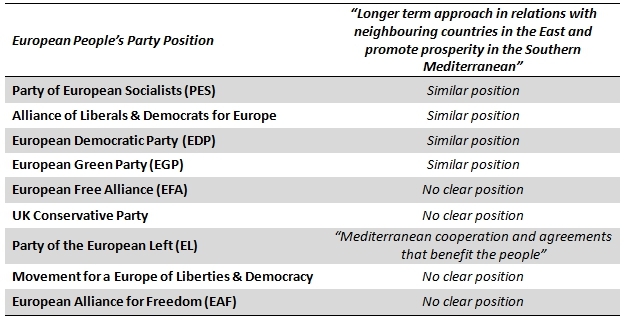 The tables show how each of the political parties’ priorities compare with those of the EPP. 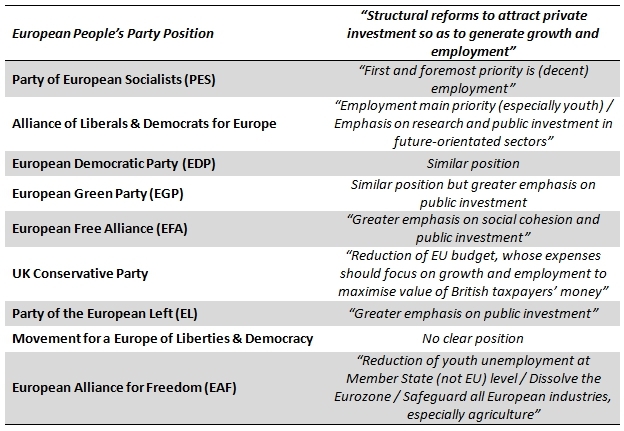 The top level of each table shows the priority articulated by the EPP in its manifesto on a particular issue, while the rows below show whether the other nine parties take a similar position or, where their priorities differ, the alternative position they articulate in their platform. 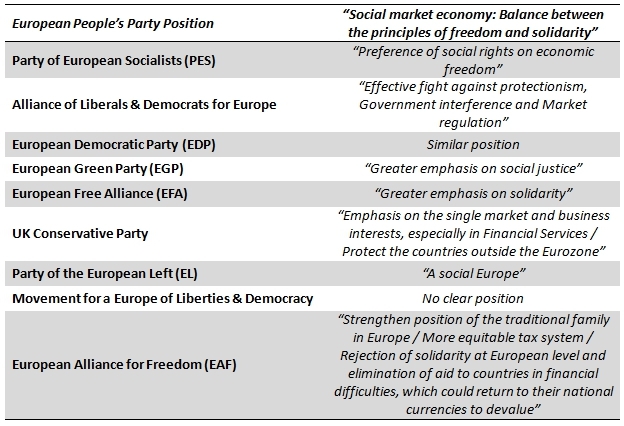 Note: The tables illustrate how the manifesto priorities of each of the European political parties compare with those of the European People’s Party (EPP) on different issues in four key themes: issues related to European integration, the economy and investment, immigration and home affairs, and foreign policy/enlargement. 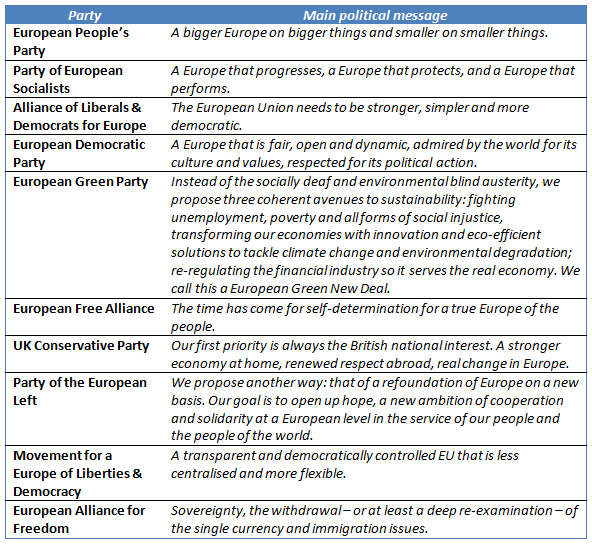 For each issue a representative description/quote is shown to illustrate the European People’s Party’s priorities. Where the party has a similar position to the EPP, this is marked in the right column as “similar position”. 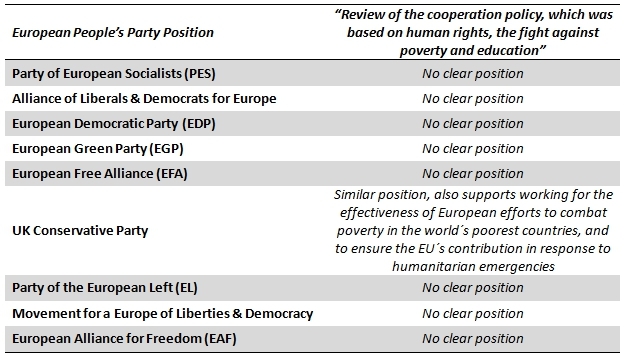 Where the party has a different priority on the issue from the EPP, a representative description/quote of the party’s position is shown in the right column. 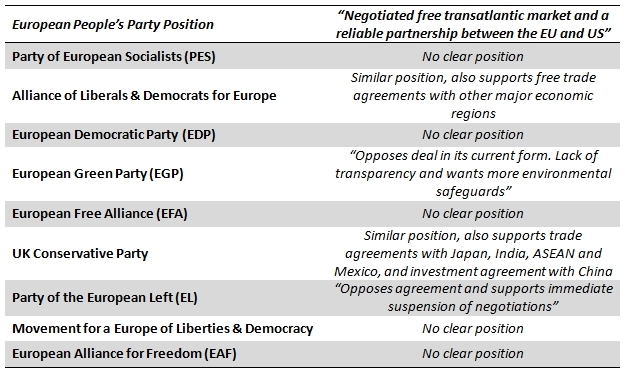 Where there is no clear position on the issue that can meaningfully be compared with the EPP’s position, the right column indicates “No clear position”. For more information on each party see: European People’s Party (EPP), Alliance of Liberals & Democrats for Europe (ALDE), European Democratic Party (EDP), European Green Party (EGP), European Free Alliance (EFA), UK Conservative Party, Party of the European Left (EL), Movement for a Europe of Liberties & Democracy (MELD), European Alliance for Freedom (EAF). Table 2, shown below, builds on this comparison to summarise the main political messages which are contained in each of the ten electoral manifestos. Note: Compiled from party manifestos. During the crisis, which began in 2007, European citizens’ confidence in the EU institutions and in the governments of the member states began to deteriorate. This has led to greater calls to strengthen democracy at the European level, with this issue forming one of the key factors in the European election campaign. 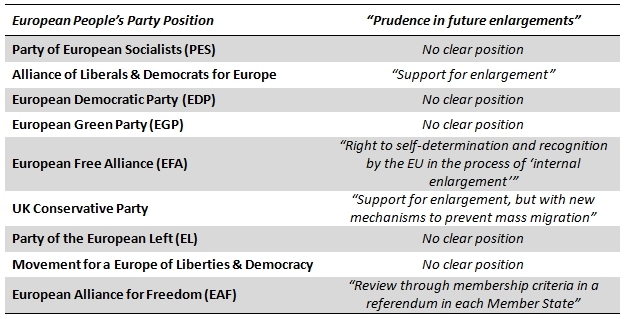 Given the central importance of EU democracy to the campaign, Table 3 illustrates a number of proposals for strengthening democracy. The column in the left indicates the proposal, while the column in the right shows which parties have articulated support for the proposal in the lead up to the 2014 elections. Note: The abbreviations for each party are European People’s Party (EPP), Alliance of Liberals & Democrats for Europe (ALDE), European Democratic Party (EDP), European Green Party (EGP), European Free Alliance (EFA), UK Conservative Party, Party of the European Left (EL), Movement for a Europe of Liberties & Democracy (MELD), European Alliance for Freedom (EAF). 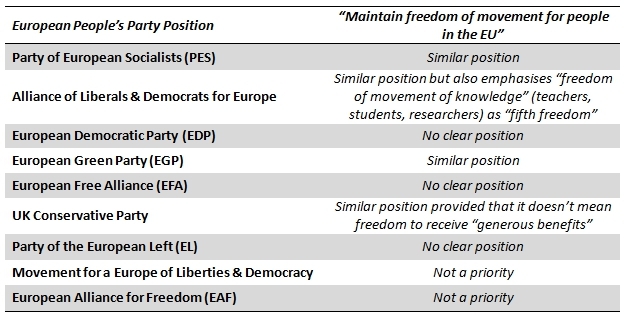 Having considered all of these differences, it is clear that the European elections represent a clear choice between different platforms. Hopefully even if voters still think that their vote on 22-25 May makes no difference, it now has a little less to do with the belief that European political parties do not have different electoral programmes. Cristina Ares Castro-Conde is Lecturer of Political Science and Public Administration at the University of Santiago de Compostela.